Welcome to the Halloween Haunts Blog Hop. A special thank you to Marian at Seams To be Sew who has worked so hard to keep all her spooky spirits organized and inspired. Cats and ghosts are happy neighbors on this candle mat. I found the pattern - Hiding In The Pumpkin Patch - as a October BOM at So Sew Easy. And my cat with his huge button eyes might well be related to the Scary Cat appearing regularly on face book. A few years ago I was given this sweet panel by a friend who was sorting her fabric. Lucky me. I love the old fashion look of the Halloween characters. I added blocks and borders. Found the coordinating fabric in my stash. Yeah!!! I think this might become a favorite couch quilt. It has already survived an afternoon nap. I am an apron wearer and could not resist this. Easy stitching when all you have to do is cut along the edge. Will be perfect for serving treats to the goblins. These place mats could easily qualify for a way to use ugly fabric contest. How can you not love cats on quilts. And this cat will not make you sneeze. I could not resist nesting him on a Halloween quilt. This is an October Block of The Month pattern from the Fat Quarter Shop . And along with the fun and inspiration we get from blog hopping at the Halloween Haunts we are really lucky to have a chance to win a $25:00 gift certificate from the Fat Quarter Shop. For a chance to win the gift certificate leave a comment and enter the drawing at Marians at Seams To be Sew. You also get a chance at Seams To Be Sew to pick up a free pattern, enter the drawing for a free pattern and to vote for top picks of the day. Wishing you all a spooky wonderful day of haunting the blogs. P.S. All these leaves were on trees two days ago. A little breeze, a bit of rain and the yard has a new carpet. Beautiful but they steal time from stitching. Love all your Halloween projects! Everything is beautiful! I used the same saying on you apron on my mini! Wish I could find one! The font thing is great very Halloween! From one ghoulie to another...Halloween projects are so fun to sew. Thanks for sharing yours! So many lovely projects, I love them all. You wer very busy....love each one, but adore that apron!!!!! Great group of projects...I really love the apron! 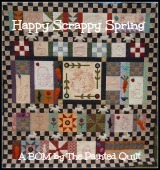 Great selection of projects, especially love the old fashioned quilt. Love the quilt, great use of a panel. Oh my awesome projects. Love the kitty candle mat. Wonderful quilt too. I don't think that fabric is ugly at all!! great way to use scraps. I love aprons and I think I'll look for a panel while I'm out today. Great Post. What a wonderful collection of Halloween goodies. It looks like you have been having a spooktacular time in your sewing cave prepping for the big day. great job on one and all. Your work is adorable, but I particularly love what you did with the Fat Quarter Shop cat - that was brilliant! Your projects are cute and fun. Love them all! Ugly fabric, hmm. It turns up at my house too. You did a good job of using yours! either leaning into something, splashing something, spilling something.and of course there is always the slip between the cup and the lip. Enjoyed the visit. Love your projects, especially the one with the vintage looking panel. What a fabulous job you did with it. Lots of fantastic projects, but OMG just adore that vintage panel! You've been busy. Lots of great projects. Love your vintage panel quilt. SO sweet. I adore all of your projects. I love kitties too. I love these small fun finishes. The FQ BOM is perfect, I love that one, and the kitty and ghost too. Love your projects especially the apron!! Ooooo I love the carpet of leaves that gorgeous quilt is laying on! That apron is so cute and the black cat on the quilt is adorable. Great projects! wow your projects are wonderful. thanks for sharing. You have been busy!! Love all your Halloween projects, but my favorite is the little girl in costume. It is just BOO-tiful! I love the vintage looking quilt. The cats are amazing too. You have done such a great job entertaining us with your beautiful pieces on this hop. oh those gremlins ..... that sure looks like a cozy quilt. and thanks for the place mat idea a great way to use up some of those leftovers from other Halloween porjects. WoW, so many fun projects to see and have fun with. I can't decide even which I like the most, but I will have to say that while I'm not an apron user... I like it.. Loved this visit today. Thank you so much for sharing your fun ideas. Great post! I like how your font turned out! Whoever is haunting you is doing a good job! Lots of great projects, despite the haunting! I've never seen a Halloween apron, very cool. What Spooktacular projects you have. Definitely looks like you are ready to celebrate Halloween. Thanks for showing all your Halloween quilts. I like to wear an apron too so especially enjoyed the Halloween one. So many cute projects. I'd say you are ready for Halloween. I love all of your projects - especially the quilt with the panel. I love the vintage look too. Thanks! WOW! I can BELIEVE that is your favorite quilt already! It is SMASHING!!! and I loved the apron! You really did have a fun time creating all of this! BRAVO! Great quilts and projects. I am just now getting around to making last month's BOM with the kitty...loved the way you changed up the colors. Thanks for sharing! I also like the old fashion illustrations for Halloween as well as other holidays. Great Halloween projects! I love your Black Cat on the quilt BoM especially! I like the vintage illustration in your quilt. Great projects! Everything looks so great. I love that apron! Lovely apron! That mug rug is too cute! thanks for showing us all these goodies! Oh, they are ALL so adorable. And yes, who don't love cats on quilts....I sure do! Well, it's the perfect time of year to have a haunted blog! Maybe the spirit will pick my name for the win! Ha! Your naptime quilt is perfect and how lucky for you to find the fabrics in your stash to complete it. It's just lovely! Great projects! You've been very busy! Thanks for sharing. Agreed, cats on quilts are perfect together. Yours are wonderful. Love those cats at the top. All of your projects are great. I really like the cat and pumpkin candle mat. Thanks for sharing all of your fun projects! I love your quilt with the vintage print. It would be my favorite couch quilt too! Your decorations and quilts are so fun! My you've been busy. Love all your Halloween projects. Nicely done. Wow so many cute projects. Wow, I love all of your Halloween projects. Awesome job! I especially love what you did with the FQS October block. It never occurred to me to make that a Halloween cat, but now it seems so obvious! Your quilts are really cute. I especially like the ones with the little girl panel. Love all your Halloween creations! Awesome! Is this your favorite holiday/time of year? You are certainly well stocked with quilts, decor, and stuff for fall. Love that apron. I love the pumpkin quilts. They are all adorable. I love all your projects! I really love your version of the FQS October block! Trick or Treat! I love all your projects! Especially the vintage panel. Oh my - I want that apron!!! Hi Frances :D Love that apron for sure, and your quilt is wonderful. I'm all about pulling from stash to complete a project, and you did a bang-up job with adding those rows and borders! You are definitely ready for the haunting day. Thanks for sharing. Great projects, love the vintage Halloween. I love any quilt with a cat especially a black cat.